One of the most frustrating experiences for vegetable gardeners is watching their beautiful tomato plants succumb to a tomato wilt fungus. Fortunately, it is possible to prevent this scourge and have healthy, delicious tomatoes in your garden. LoveToKnow recently spoke with Sunset magazine's Associate Garden Editor Julie Chai about tomato wilt and how you can protect your garden. LoveToKnow (LTK): What is tomato wilt? Julie Chai (JC): Fusarium wilt and verticillium wilt are fungal diseases that can live in soil. On tomatoes, they cause leaves and branches to wilt then die, usually starting at the bottom of the plant, and may limit or stop fruit from developing. LTK: Are different types of wilt more common to specific climates? JC: You're most likely to see symptoms of both in warm weather-fusarium is at its strongest when soil temps are in the low-80s, and air temps are above 70. LTK: What varieties of tomatoes are most resistant to wilt problems? JC: If wilt has been a problem for you, look for varieties labeled V, F, or FF. There are literally hundreds of tomato varieties to choose from, and the best ones for you will vary based on your specific climate. Your local independent nurseries generally carry ones that do well in your region. LTK: Aside from using resistant varieties, what can be done to prevent tomato wilt? JC: Since these fungi live in the soil, it's important to practice crop rotation, especially if you've had a problem with wilt. This means not planting tomatoes-or potatoes, peppers, or eggplants, since they're all related-in the same spot more than once every four years. If that's not possible, you can grow tomatoes in large, sterilized containers or raised beds, and use sterile potting soil every year. Another practice that can help is to solarize your soil. You do this by laying a thick (1 to 2 mil) sheet of clear plastic over affected areas for four to six weeks in summer. 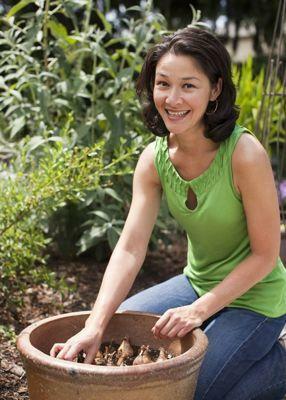 (You can keep the plastic in place by staking or setting heavy stones over the edges.) This heats the soil and can kill many pests living in it. Also, always us sterilized tools, and do all you can to keep plants healthy since strong plants are more resistant. LTK: Once a plant is affected by wilt, what can be done to remedy the problem? JC: If a tomato plant has fusarium or verticillium wilt, it's best to pull up the plant and throw it away in the trash- don't add it to your compost. LTK: What tips can you offer to grow healthy, productive tomatoes? JC: Always mix a thick layer (4 to 6 inches) of mature compost into your soil before planting, and since tomatoes love heat, grow them in full sun (this means six hours a day, at the very least). At planting time, stake or cage your tomatoes to keep them off the ground and give them good air circulation, then water regularly and deeply since tomatoes have deep roots. It's best to water in the early part of the day, and avoid getting water on the leaves. LoveToKnow would like to thank Julie Chai for taking the time for this interview. If you would like to learn more about tomato wilt as well as wilt resistant varieties of tomatoes, visit Cornell University's Verticillium Wilt page as well as the page on Fusarium Wilt from Texas A&M.